Shirts With Random Triangles: Florida hires Jim McElwain away from Colorado State. 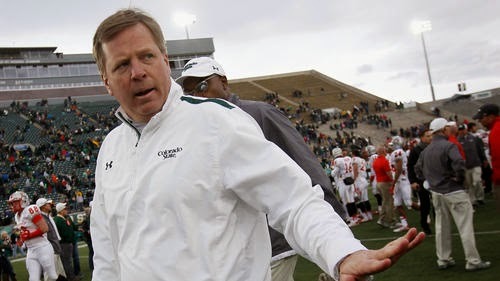 Under McElwain, Colorado St. was 22-16 in his three seasons with the Rams. Before that, he served as Nick Saban's offensive coordinator from 2008-2012, where he helped Saban lead the Crimson Tide win two BCS titles in 2010 and 2012. McElwain helped develop quarterbacks Greg McElroy and A.J. McCarron during his time in Tuscaloosa. That's something needed at Florida, where the Gators have struggled at that position since the departure of Tim Tebow. McElwain's deal with Florida includes what is being described as the largest "school-to-school buyout" in college football history, which includes Florida paying Colorado St. $3 million dollars over the next six years, and a future game in The Swamp between the Rams and Gators. The game will be scheduled for some point between the 2017 and 2020 college football seasons.